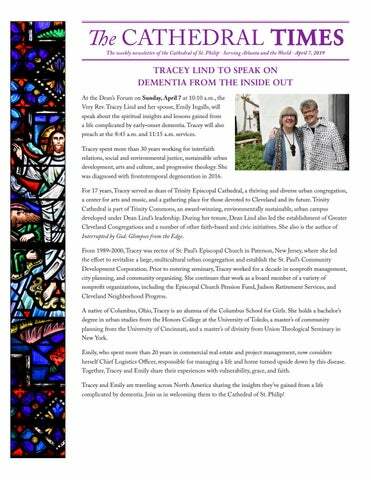 TRACEY LIND TO SPEAK ON DEMENTIA FROM THE INSIDE OUT At the Dean’s Forum on Sunday, April 7 at 10:10 a.m., the Very Rev. Tracey Lind and her spouse, Emily Ingalls, will speak about the spiritual insights and lessons gained from a life complicated by early-onset dementia. Tracey will also preach at the 8:45 a.m. and 11:15 a.m. services. Tracey spent more than 30 years working for interfaith relations, social and environmental justice, sustainable urban development, arts and culture, and progressive theology. She was diagnosed with frontotemporal degeneration in 2016. For 17 years, Tracey served as dean of Trinity Episcopal Cathedral, a thriving and diverse urban congregation, a center for arts and music, and a gathering place for those devoted to Cleveland and its future. Trinity Cathedral is part of Trinity Commons, an award-winning, environmentally sustainable, urban campus developed under Dean Lind’s leadership. During her tenure, Dean Lind also led the establishment of Greater Cleveland Congregations and a number of other faith-based and civic initiatives. She also is the author of Interrupted by God: Glimpses from the Edge. From 1989-2000, Tracey was rector of St. Paul’s Episcopal Church in Paterson, New Jersey, where she led the effort to revitalize a large, multicultural urban congregation and establish the St. Paul’s Community Development Corporation. Prior to entering seminary, Tracey worked for a decade in nonprofit management, city planning, and community organizing. She continues that work as a board member of a variety of nonprofit organizations, including the Episcopal Church Pension Fund, Judson Retirement Services, and Cleveland Neighborhood Progress. A native of Columbus, Ohio, Tracey is an alumna of the Columbus School for Girls. She holds a bachelor’s degree in urban studies from the Honors College at the University of Toledo, a master’s of community planning from the University of Cincinnati, and a master’s of divinity from Union Theological Seminary in New York. Emily, who spent more than 20 years in commercial real estate and project management, now considers herself Chief Logistics Officer, responsible for managing a life and home turned upside down by this disease. Together, Tracey and Emily share their experiences with vulnerability, grace, and faith. Tracey and Emily are traveling across North America sharing the insights they’ve gained from a life complicated by dementia. Join us in welcoming them to the Cathedral of St. Philip! CATHEDRAL TIMES SUBMISSION DEADLINES: FOR THE SUNDAY, APRIL 14 ISSUE, THE DEADLINE IS WEDNESDAY, APRIL 3. FOR THE SUNDAY, APRIL 21 ISSUE, THE DEADLINE IS WEDNESDAY, APRIL 10. PLEASE EMAIL ANNOUNCEMENT REQUESTS TO THE EDITOR, DAN MURPHY, AT DMURPHY@CATHEDRALATL. ORG. 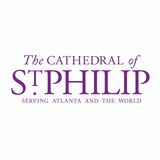 TO RECEIVE THE TIMES BY EMAIL, CONTACT JANIE HARRIS AT JHARRIS@CATHEDRALATL.ORG. Room 120 Adult Confirmation class is held in Room 120 during the 10:10 a.m. Sunday School hour. These classes are open to all, regardless of plans to be confirmed. In the fall, our Living Faith class studied “Falling in Love with the Bible Again.” This is a continuation of that conversation, but moving to “Falling in Love with the Church Again.” Those wishing to participate in this class in order to be confirmed, re-affirmed, or received should contact Canon Lauren Holder, lholder@cathedralATL.org, and mark your calendars for our April 28 confirmation service. Child Hall The Very Rev. Tracey Lind and her spouse Emily Ingalls will speak at the Dean’s Forum on the spirituality of dementia. PARENT COFFEE HOUR Room 121 Parents and caregivers who have youth meet to have a selfguided discussion on the topics youth are discussing in the Confirmation program, as well as how to support each other. If you are interested in this discussion but do not have a youth in the program, please feel free to join anyway! This group meets Sundays at 10:10 a.m. in Room 121. LENTEN SERIES WITH DR. LUKE TIMOTHY JOHNSON MIRACLES, THEN AND NOW: GOD’S PRESENCE AND POWER IN CREATION WEDNESDAYS THROUGH APRIL 10 DINNER 5:30 P.M.
Why Resiliency is So Important to Teach to and Nurture in Our Kids Our Raising Youth series is back with Kathy Roberts coming to speak this Sunday, April 7 at 6 p.m. As pendulums do, they will swing through a wide arc and swing right back. In the last decade, the parenting pendulum took us through a period of overprotection, helicopter parenting, and smoothing out the bumps and valleys of our children’s lives. Mostly out of fear and good intentions, we DID lots of things for our kids that they could have done for themselves. Our kids became Dis–abled, Dis-couraged, and lost confidence in their own skills. Most are now learning how to fail and recover at the age of 25, which is not ideal. But we parents are resilient and can learn a new way (or an old way!) to En-able and En-courage our kids to live independently, confidently and resiliently. Come share and learn with us as we see how we got to this place and how to change our path forward. Please RSVP to Maggie Paul, mpaul@cathedralATL.org. Our next Habitat home will be built on Saturdays beginning this Saturday, April 6, and continuing through June 8 (skipping Easter and Memorial Day weekends). We welcome past builders and new builders. If you have never built, come be part of this exciting ministry. No skills required, just your enthusiasm. We will give you the tools and training that you need to make a contribution. You can sign up to build or join our lunch team in the Atrium on Sundays, online at stphilip.atlantahabitat.volunteerhub.com or contact John Champion at 404-307-0817, jchampion@bellsouth.net to get additional information. Do you enjoy eating good food and meeting new people? Then Foyers is for you! Experience friends, food, and fellowship in small groups of 8-10 each month beginning with Super Foyers this Sunday, April 7 at 6 p.m. in Child Hall. Please contact Jennifer DuBose, jdebose@goddard-group.com, with your name, address, phone number, and email to sign up. EASTER FLOWERING THE CROSS ON EASTER The Flower Guild is bringing back an old church tradition of inviting everyone (especially children) to bring their favorite fresh flower to church to place on the cross in the Atrium on Easter morning. Flowering the Cross - adding live flowers to a barren cross - symbolizes our rejoicing in the new life of Resurrection. The flowers can be picked from your garden, selected at the grocery store or bought at a florist. Choose any flower with a strong stem and position it wherever you like on the cross. This Sunday, April 7, the Cathedral’s own organist and associate choirmaster, Dr. Patrick A. Scott, will perform as our recitalist at 3:15 p.m. Patrick will utilize one of his more amazing talents as he improvises on the Stations of the Cross, matching each of the traditional 14 stations to familiar hymn tunes whose text reflects that of each station. The improvisation will be in the style and mood of what’s happening during each of the stations. Don’t miss the chance to hear one of the great talents of this generation! On Palm Sunday, April 14, at 4 p.m., the Cathedral Schola will present A Meditation on the Passion of Christ, with Carols. One of the most profound choral services of the year, this meditation employs lessons and carols, spirituals, anthems, motets, and congregational hymns to illuminate the Passion of Christ, which is retold using biblical narratives from Mark, Matthew, and John, sung to some of the most ancient plainchant known to the Church. Domingo de palma, 14 Abril, tenemos procesión alrededor de la iglesia. Nos juntamos a las 11am en frente de la entrada de la iglesia. Via Crucis es servicio de Viernes Santo en la Capilla Mikell. 19 Abril a las 7 p.m. Pascua es 21 Abril en la Capilla Mikell a las 1115 a.m. Confirmación es 28 Abril en la Catedral. Así tendremos servicio bilingüea las 1115 a.m. No habrá servicio en Español este Domingo. The Cathedral Book Store is accepting applications for a full time manager. The store manager oversees all the daily operations of the store, managing all employees and volunteers. The manager also oversees the implementation of its merchandising, marketing, advertising, and financial strategy while maintaining its mission of creating an engaged and thoughtful community where everyone can find something to enrich or inspire them on their faith journey. Contact Fay Swennes, fayswennes@yahoo.com or 404237-2523, for a more detailed job description or to apply. Servicio con Primera Comunión es 5 Mayo en la Capilla Mikell a las 1115 a.m.
La Escuela de Biblia de Vacaciones Quien es mi prójimo, Conocer como amar como Jesús. Pueden registrar sus niños edad 3 hasta 10 en este sitio: cathedralATL.org/weekofwonder. COMMON GROUND this Sunday, April 7!